The Renewable Energy Centre of Excellence has started to create a green economy in the Northern Cape. As one of the sunniest countries on earth, South Africa recently moved into the world’s top 10 of countries harnessing renewable energy from the sun. The launch of Upington’s Renewable Energy Centre of Excellence (RECE) at the Northern Cape Rural FET College will, going forward, be the cornerstone of solar power energy in the province and play a leading regional role, constituting an important entry point for the broad-based economic empowerment of the solar industry. The province has some of the best conditions for solar power in the world — abundant availability of flat and sparsely populated land, the ability to connect to the electricity grid at multiple points, water from the Orange River and a dev-eloped highway system. This offers not only a unique opportunity for solar power generation but also for the testing and demonstration of solar energy systems. The Premier of the Northern Cape, Sylvia Lucas, said in an interview that the development of the Provincial Renewable Energy Strategy is a manifestation of the fast growing renewable energy and green economy sector in the province. “We are well on our way to becoming a net producer of renewable energy to the rest of the country by 2020. Solar energy in the main is expected to un-lock existing potential and to position the province to attract both local and foreign investment. “To keep abreast of the changes and opportunities that the renewable energy sector presents, we need to gear up our learners to develop their knowledge and expertise to contribute to developing the local solar industry. This will assist us in closing the skills gap along the clean energy value chain. 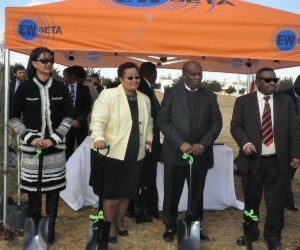 “We are grateful to the Department of Higher Education, the Energy and Water Sector Education and Training Authority (EWSETA) and the urban and rural technical and vocational education and training (TVET) colleges for their efforts and partnership with the province to help us develop and skill learners in this crucial sector,” said Lucas. The RECE was built in response to the call for green skills development in the energy and water sectors and the Northern Cape Provincial Growth and Development Strategy. The Northern Cape provincial and local governments and TVET Colleges of the Northern Cape are partners in the state-owned facility, which was initially established and funded by the EWSETA for R42 million, over and above the R82 million for skills development for renewable energy to the TVET Colleges in the Northern Cape. According to the CEO of EWSETA, Errol Gradwell, the skills shortage has led developers to source internationally many of the temporary jobs needed for the construction of the first projects under the Renewable Energy Independent Power Producer Procurement Programme (REIPPPP). “However, building on the market assessment conducted by GreenMax on behalf of EWSETA and the Northern Cape Provincial Government, the RECE will contribute to generating the necessary skills to cover around 10 000 temporary jobs and 1 300 still to be created by solar power projects within the current REIPPPP. 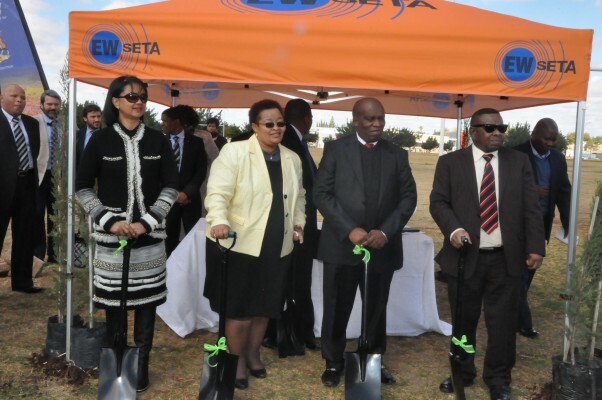 The RECE will also be instrumental in facilitating the creation of the Solar Park, which will generate at least 23 000 temporary jobs and 2 600 permanent jobs,” says Gradwell. The RECE has established partnerships with relevant national universities including Nelson Mandela Metropolitan University, University of Johannesburg, Tshwane University of Technology and the newly established Sol Plaatje University, as well as international universities such as the Ferrara University and the Bologna University in Italy, and the 4U Alliance Universities in Madrid and Barcelona in Spain. It will play a key role in training and research, assisting the region and country in renewable energy programmes, with specific emphasis on solar and related energy options. It will be instrumental in raising awareness, disseminating knowledge and coordinating initiatives to ensure the successful transition to a Green Economy, which requires a total turnaround of existing systems that is not possible without the engagement and coordination of all stakeholders. EWSETA has partnered with the world’s largest renewable energy research centre, CENER, in Spain, and technology entities such as the National Research Council in Italy, Plataforma Solar de Almeria (PSA), Centre for Technologies and Advanced Energy Research (CTAER), Energy Storage Research Centre (Energy Egune), Centre for Innovation and Applied Research for Vocational Education and Training (TKNIKA) are partnering in this initiative. They will play a pivotal role in R&D and lead the development of sustainable and green skills courses at Northern Cape rural and urban TVET campuses and the Sol Plaatje University in the Northern Cape. and are committed to play their role. “The Northern Cape Provincial Government, together with EWSETA, has identified RECE as one of our flagship projects that will respond to the country’s energy security objectives, in line with the emphasis placed on this sector by the President and government at large,” says Lucas.